This is a fine 1835 example of the Society for the Diffusion of Useful Knowledge or S.D.U.K. 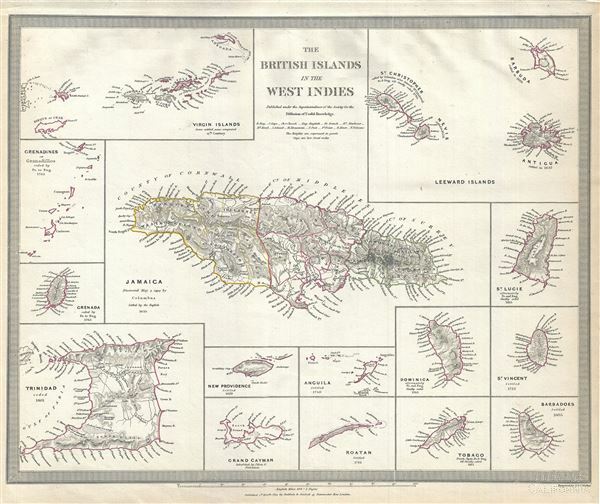 map of the British Islands in the West Indies. Essentially fifteen maps on one sheet and centered on a large map of Jamaica, it covers the Islands of Trinidad, Grenada, St. Lucie, St. Vincent, Barbados, Tobago, Dominica, Anguila, Roatan, Grand Cayman, New Providence, the Grenadines or Granadillos, the Virgin Islands and the Leeward Islands. Also notes the dates of discovery as well as the dates the islands were ceded or settled by the British. Shows rivers, bays, mountains, and other topographical features. This map was originally published by Baldwin and Cradock and copyrighted in 1835, but was issued in Volume two of Chapman and Hall's 1844 edition of Maps of the Society for the Diffusion of Useful Knowledge. It was engraved by John Walker of J. and C. Walker. Rumsey 0890.143. Phillips (Atlases) 794.